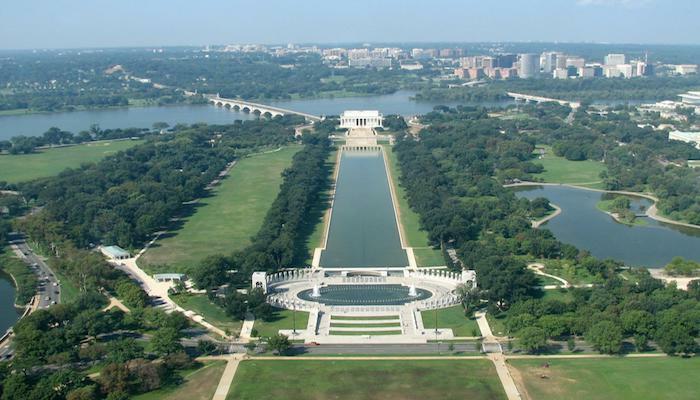 Washington, D.C. is one of our favorite running cities. 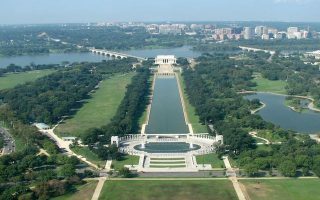 A run on The Mall and the Lincoln Memorial, and then out to the FDR and MLK Memorials, is one of the most inspiring runs in the world. 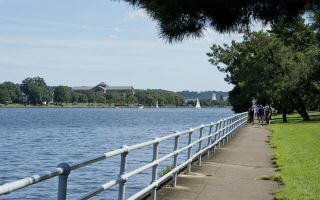 Washington is beautifully laid out for runners, with miles of paths around its most visited destinations, and then radiating outward to Virginia and Maryland. Washington is very much a walking city, and the main streets and sidewalks radiating from the Capitol are wonderfully wide. 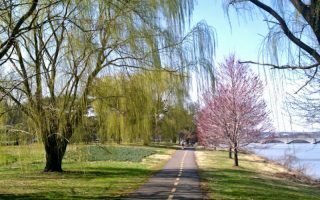 In addition to some wonderful routes in the heart of the city, our guide to running in Washington, DC includes beautiful paths along Rock Creek Park and following the old B&O railroad. The Anacostia Riverwalk is a relatively new addition to the D.C. running scene, with 15+ miles of trails just south of the Capitol. We’ve also developed separate guides for Virginia and Maryland just over the D.C. border. Washington is a fairly flat city. You won’t find a lot of hills on the iconic routes. Embassy Row is a good area to do some hills. Summers are famously hot and humid and winters are generally snow-free. 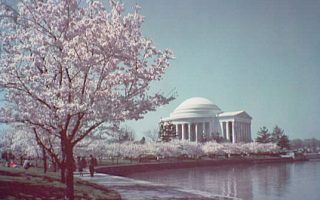 Catching the Ellipse during Cherry Blossom season the first two weeks in April, should be on any runner’s bucket list. Goof public transportation improves the running scene in D.C. The metro runs all over the city except into Georgetown. It also goes into Maryland and Virginia. This makes it easier to start a run in one place and end up in another. Washington also has a growing bike share program and an expanding network of bike lanes on its unusually wide streets. The signature run in Washington and one of the most memorable runs in the world. 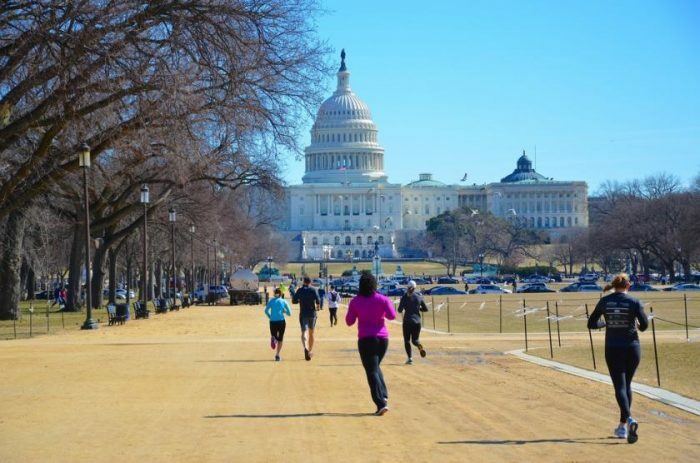 Run on a packed dirt surface between the Capitol and the Lincoln Memorial. Also good at night. One of the most unique and inspiring runs anywhere, incorporating scenery, history, and beauty. 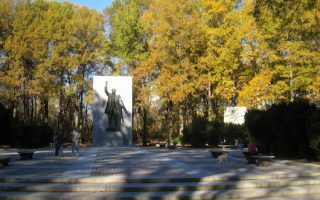 The core “Memorial Run” incorporates the Washington Monument, and the Jefferson, FDR Memorial, and MLK Memorials. 4.4 mile loop along the outer edge of this man-made island, adjacent to the Jefferson Memorial. Great views of the water, Reagan Airport and D.C. landmarks. Can be a standalone run or done in combo with Mall/Memorials tour. A recent addition to the D.C. running scene. 20 miles of trail, 12 of which is mainly complete. We've mapped a great 8-mile loop between South Capitol St. and Benning Rd. on both sides of the River. Anacostia Park is site of weekly Parkrun. 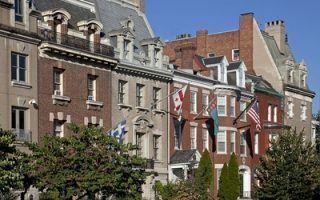 This run along the wide sidewalks of Massachusetts Ave. takes you by 150+ embassies, the Naval Observatory home of the Vice President), and ending at the National Cathedral. A hidden gem, and a wonderful option to enjoy shade and Washington’s lush foliage. 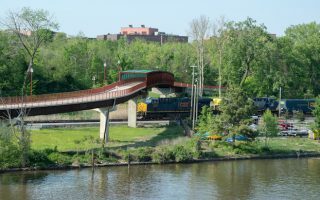 Myriad trail options and a good option near Georgetown. 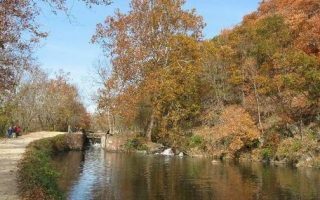 A tow path that runs along the Potomac River, 184 miles to Cumberland, MD. Accessible from Rock Creek Park, and a good option near Georgetown. Part of the Potomac Heritage National Scenic Trail. 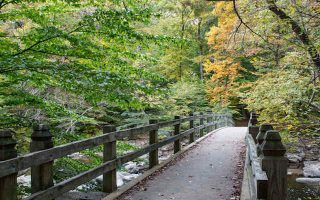 A 17 miles paved hiking/cycling path in Northern Virginia that travels between Rosslyn and George Washington’s home at Mount Vernon. Island dedicated as a memorial to President Theodore Roosevelt. A couple of miles of trails on a natural surface. Location of a weekly 5k Parkrun, Saturdays 9am. Washington is a good city for running year-round. The biggest issue is the height of summer, where temps average near 90F (32C) during the day and stay in the 70s at night. It’s humid. Running from mid-June through mid-December can be a challenge. Autumn is gorgeous and holds on well into November. Winters are cool but rarely frigid, with temps dipping below freezing at night. It snows a few times a year and the roads/pathways can get icy. 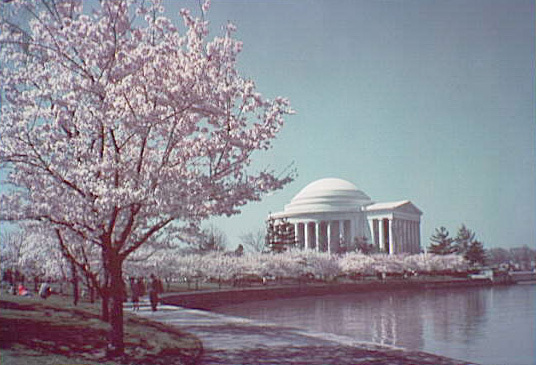 Spring is known for the famous cherry blossoms, which peak in the first two weeks of April. The map below provides a good idea of where the areas to stay are in proximity to the best running routes. Try to stay within a mile or so from some point along the National Mall, if you can. Basically the rectangle west of the Capitol/Union Station and south of K Street. If you end up a little beyond that, you can always use the Metro or do a Capitol Bike Share drop off. 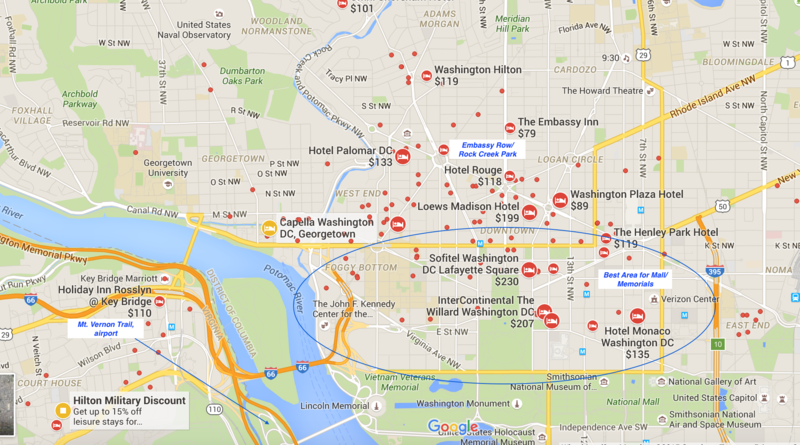 If you are staying in the Dupont Circle area or further north, Embassy Row and Rock Creek Park are good running bets. If in the Georgetown area, lovely sections of the C&O Trail and the Rock Creek trail are accessible. If you are staying over the border in the Alexandria, Virginia area, connect to the Mt. Vernon trail. Georgetown Running Company. Best independently owned running store in the Georgetown area. Nike Georgetown. Numerous group runs, training runs. Athleta, Nike Store, Lululemon are also all in Georgetown. Pacers Running Company. On 14th St. They also have locations in the Navy Yard & Alexandria. Numerous free group runs throughout the week and also paid coaching/training runs. Fleet Feet DC. In the Rock Creek/Adams Morgan area. Numerous group runs. DC Road Runners is the most important running club in the area. They require membership but anyone can try their Saturday morning long runs. Marine Corps Marathon. October. The “Marathon of Monuments” is of the more famous marathons in the country. 20,000+ runners annually. Loved in part because it’s flat and takes place entirely in D.C. A 10k takes place simultaneously. Navy Airforce Half Marathon and Navy 5-miler. September. Popular race along Rock Creek trail and monuments. Rock and Roll Series. March. DC version of popular series. Marathon, Half, & 5k. Course goes up into Maryland. Cherry Blossom Festival 10-miler. First Sunday in April. Very popular, occurs during height of Cherry Blossoms. Lottery.